Chill dough for easier handling. Next, preheat grill to medium. Using a cast iron skillet, brown ground beef and add minced onion and steak seasoning blend when cooked through. Toss in Monterrey Jack/Colby cheese blend and sliced white American cheese. Stir until melted and well blended. Remove cheeseburger mixture from heat and set aside. Next, working quickly with chilled dough, roll out prepared pizza crust on parchment paper and brush on egg wash. Arrange American cheese slices to make 6 poptarts. Top each cheese slice with ⅓ cup cheeseburger mixture, spreading slightly. 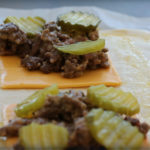 Place 4 pickles on top of meat for each tart. Top with the remaining prepared pizza dough and cut between cheese slices to separate the 6 tarts. Carefully, using kitchen scissors, cut the parchment to further separate, and seal the edges with egg wash and a fork. In addition, baste tops with remaining egg wash and sprinkle each with sesame seeds. Finally, grill 5 minutes per side. (Or more watch for browning) Serve with sliced tomatoes, ketchup and mustard. Is there something you’d like more in a poptart? Tell me in the comments!